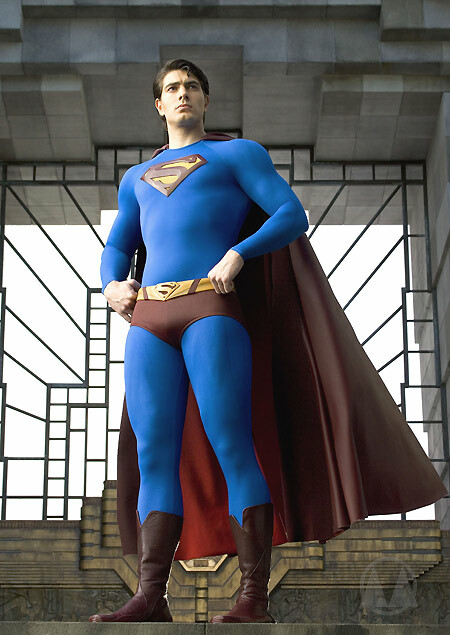 Warner Bros has released the first official photo' of Brandon Routh as Superman. A much larger version is available here. There's another new Zeta Minor DVD review today! Contributor Tim Symonds has examined the Two-Disc Extreme Edition of Alien Vs Predator, which was released a few weeks ago. Once again, the UK division of Twentieth Century Fox Home Entertainment has created a much better offering than the single-disc edition that those in the US are currently saddled with. Click on the sleeve image, right, or here, to read Tim's review. Twentieth Century Fox Home Entertainment has delayed the release of Tru Calling... again. The set is now scheduled for release on June the 27th. HBO Video will release the second season of Everybody Loves Raymond on the 4th of July. The five-disc set will feature twenty-five episodes. Two of them will feature commentary tracks by star Ray Romano and series creator Phil Rosenthal. There will also be bloopers and deleted scenes. The RRP is £39.99. Update: I've spoken to Warner Home Video about the Hustle problem. Both they and the production company are now aware of the problem. I've also spoken to 2 Entertain about the discrepancy between the original running time of State of Play, and the running times on the BBFC website. They tell me that they're aware of this, and have already re-submitted uncut versions to the BBFC. What a shocker - we have a new review for you today! I've updated the Hammer DVD Guide, with some details of DD Video's Hammer House of Mystery and Suspense releases. Neither Incoming nor the Offers pages have been updated at all this week, for which I apologise. Dickie Davies presents a new, eighty-four minute compilation, The Best of ITV Wrestling, which will be released by Granada Ventures on June the 6th. The disc will feature highlights from "all the classic bouts", including the final grudge match between Big Daddy and Giant Haystacks. 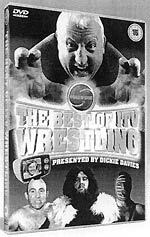 Other wrestlers featured on the disc include "Mean" Mick McManus, Catweazle, Pat Roach, Kendo Nagasaki, Gorgeous George and Mark "Rollerball" Rocco. Presumably they'll be able to afford a colour sleeve image by the time the disc is released... The disc has an RRP of £15.99. Granada Ventures will release a "digitally restored" version of the Stephen Fry / Hugh Laurie Jeeves and Wooster series on July the 18th. This will supersede the existing set, from VCI, which is now deleted. The eight-disc Jeeves and Wooster - The Complete DVD Box Set will feature all four seasons, and has an RRP of £49.99. There's trouble brewing about this week's release of the first series of Hustle, from Warner Home Video. It appears that the disc's producers have used heavily-edited copies of the episodes, which are about seven minutes shorter than the televised versions. A similar problem may also afflict the release of the BBC political drama series State of Play, which is due on May the 9th. The episodes certificated at the BBFC run about fifty-two minutes, well short of the hour they ran when the BBC showed it. My thanks to John Riley and Michael Binks for drawing this to my attention. A Roobarb's DVD Forum thread discussing the Hustle cuts can be found here. Anchor Bay UK will release Return to the Batcave - The Misadventures of Adam and Burt on June the 20th (a couple of weeks earlier than previously announced). The disc will tell the behind-the-scenes story of the Batman TV series. Buena Vista Home Entertainment will release two half-decent comedies on May the 9th: the Bernie Mac vehicle Mr 3000 (about an arrogant baseball player who has been retired and living off his reputation for nine years when it's discovered that his batting record was miscalculated, and that he's actually three runs short); and the Alec Baldwin / Matthew Broderick film Last Shot (based on a true story, about the FBI mounting a fake movie production to enable them to expose mob corruption). The press release doesn't mention any bonus features, but it's likely that both discs will have them. (The US versions of both have extensive supplements, including commentary tracks). The press release was similarly bereft of any technical specifications, and, for that matter, the RRP.